Hello and welcome to our class page. My name is Mrs Goldsmith and I am the class teacher in MG. We are supported by our LSAs Mrs Impey and Miss Wilson. Here you will find information about lessons and activities happening in our class. Please pop back to keep up to date with your child's learning! ​​Wednesday at 3 o'clock is our class 'drop in' session. Here, you can pop in for a quick chat. If you need to make a more formal appointment, please contact the office. Alternatively, you can use the contact form on this page to e mail me and I will reply as soon ​as possible. Our class voted for our school council representatives. We will share our learning with our Green Beach Hut classmates in RBe, LM and UHa. We meet weekly for reading and assemblies. We often have the opportunity to take our learning outside, or get an extra play time! Please can children come into school prepared for the cold weather. It can be very uncomfortable if children are outside for more than half an hour for lunch time play and lessons, if they only have a light jacket and unsuitable footwear. Children can bring boots into school for playtimes. If they come to school in boots, please bring in school shoes that they can change into. Gloves and hats are a good idea too - names in all of these please! Our PE sessions are on Monday afternoons (indoors) and Tuesday afternoons (outdoors). Please ensure the correct kit is in ​school and should be clearly named. If your child has their ears pierced, they must be removed before school if they cannot take them out by themselves. Long hair must also be tied back. 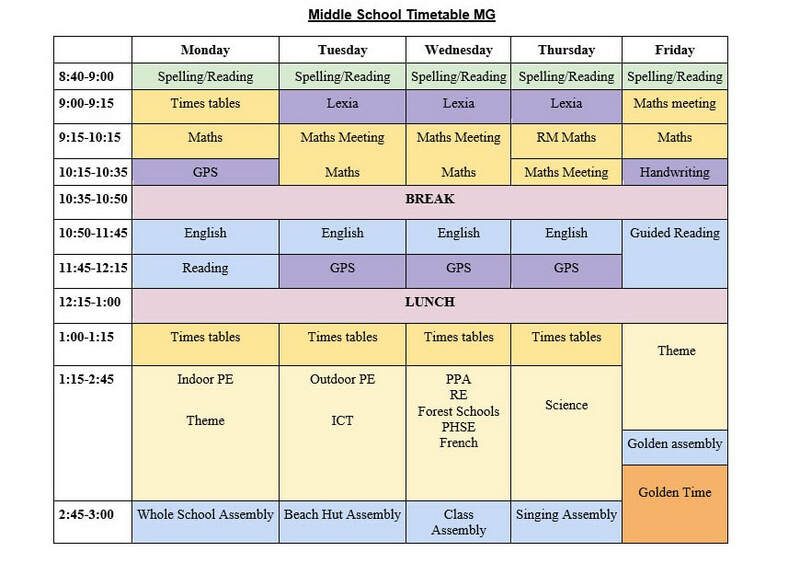 Spellings and times tables will be tested on a weekly basis. Children do have the opportunity to practise these in school, however, there is an expectation that practising will continue at home to boost their success. Children receive stickers, certificates and rewards when they achieve their individual targets. Homework is due in on Mondays. There will be a rotation of Maths, English and Learning log style homework with a week to practise times tables and spellings. Reading records can be found in the small books and should be signed to show how many times your child has read - at least four times a week. Homework is given out again on Tuesdays. Each term we also invite children and parents to join together for a parent - pupil project. It is a great opportunity to create something special with your child. We have had paint, wood, cardboard and even cake used as building materials! The only restriction will be the size of your project. In MG we have discussed what it means to be a successful learner. We use our thinking skills characters and our core values to set out our ideas. Our favourite is Yeti! Ask your children to tell you why we love him so much! This term, we are discovering the rainforests! ​This topic will see us travel the world to look at the beautiful world of the rainforests. Our journey will take us to the Amazon, where we will learn all about the plants and animals that can be found in the layers of the jungle. In Geography, we see where in the world the rainforests can be found and learn about their climates. Habitats and food chains will help us understand the delicate balance of life in the forests. Children are already discovering the huge variety of flora and fauna that exists - ask them to name a few! The Great Kapok Tree is the amazing text we are using to inspire our writing. With such rich descriptions, this book will support the children in writing their own version - but a little closer to home. This half term, our indoor PE session has changed to a Monday, as we are very lucky to have Mrs Clemenson teaching dance. Using the animals as an inspiration, children will be choreographing a dance sequence in groups. This really highlights the creativity in our class! For Art, we are basing our key skills on painting using watercolours. Building on previous experience, we will produce artwork using Henri Rousseau's work as a stimulus. We have been creating our own rainforest in class. Watch it grow as the term continues. Thank you to everyone who has bought in some rainforest creatures to hide out in the forest! Our theme for this term is Ancient Egypt. This topic is always a favourite with the children and we are looking forward to sharing our learning with you. Keep a look out for updates. Thank you to those who have created such brilliant pyramids. They are all so different.